So what can you do to help end child labor in the production of cocoa & chocolate? It’s easy, just spend your money with companies that adhere to Fair Trade practices. There are lots of companies who produce Fair Trade chocolate, and many retailers who sell it, including Amazon. 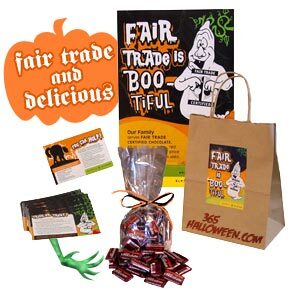 There is even a Fair Trade Halloween kit available for treat-giving on The Big Night. In addition to 42 delicious chocolates, the kit has 42 Halloween postcards to hand out that give knowledge about the importance of Fair Trade. You can still give out yummy chocolate candies, but toss an informative postcard into their candy sacks at the same time and you’ll help spread the word, too. Another alternative: give non-chocolate goodies on Halloween. Our favorites are Lara Bars (their Chocolat line uses cocoa) and Dagoba, Green & Blacks and Endangered Species. What’s your favorite brand of Fair Trade chocolate? Subscribe to comments with RSS or TrackBack to 'Celebrate Fair Trade Month with FT Chocolate'. Great article, thanks. I really like Rapunzel brand fair trade chocolate, and Lake Champlain makes a great fair trade cocoa for baking.